In what some people are calling the real World Series, the Boston Red Sox will face the Houston Astros in the 2018 ALCS. This series will be a repeat of last year’s ALDS in which the Astros eliminated the Red Sox in four games on their way to winning the World Series. 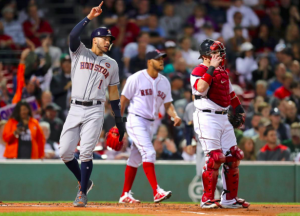 The Red Sox will hope for better fortune this time around as they try to stop the Astros from repeating as world champions. Let’s take a closer look at this series to see what side has the upper hand. The Red Sox were the best offensive team in baseball during the regular season, so there’s little doubt they have the edge in this department. Naturally, all eyes are on the quartet of Mookie Betts, Xander Bogaerts, Andrew Benintendi, and J.D. Martinez. The Red Sox will look to those four to carry them against the Astros. However, Boston’s win in the ALDS was due in part to getting contributions from the bottom half of their lineup. Brock Holt, Ian Kinsler, Steve Pearce, and others all found ways to chip in, and that will need to continue in the ALCS. The Astros, meanwhile, put on quite a show against Cleveland’s pitching staff during the ALDS. Alex Bregman, Josh Reddick, and George Springer are all scorching hot heading into the ALCS. The Astros also know they can rely on Jose Altuve to be the sparkplug at the top of the lineup. During the regular season, Houston’s lineup wasn’t quite as explosive as it was during the regular season. But if they can start clicking, the Astros have as much offensive potential as Boston. The X-factor could be Carlos Correa, who struggled in the second half of the season and was just 1 for 10 against the Indians. Houston’s rotation was undoubtedly the best in baseball during the regular season, and there’s no reason to think that will change in the postseason. Gerrit Cole was the most dominant in his start against the Indians, but the Astros will also feel confident with Justin Verlander and Dallas Keuchel getting two starts in this series. Charlie Morton also gives the Astros a great candidate as the no. 4 starter after going 15-3 with a 3.13 ERA this year. Morton being their fourth-best starter with those numbers tells you everything you need to know about Houston’s rotation. Of course, the Red Sox probably feel better about their rotation heading into the ALCS than they did before the start of the playoffs. Chris Sale remains the ace, and the Red Sox will always feel good about their chances with him on the mound. However, Nathan Eovaldi and Rick Porcello were both impressive against the Yankees, which should give the Red Sox confidence that they can handle the Astros as well. The wild card remains David Price, who added to his postseason woes by failing to get out of the 2nd inning against the Yankees during the ALDS. He gives Boston’s rotation a sizable question mark heading into the ALCS. The Astros had the best bullpen in the American League during the regular season, giving them an edge over Boston in that area. Closer Roberto Osuna has been lights out since his controversial trade to Houston over the summer. Ryan Pressly has also proven to be a key midseason acquisition for the Astros, as he’s excelled in a setup role. The Astros also feature far more depth than they did a year ago, especially with Colin McHugh and Lance McCullers Jr. giving them two pitchers who are capable of pitching multiple innings out of the bullpen. To be fair, Boston’s bullpen was better than expected during the ALDS. Closer Craig Kimbrel gave up some runs, but the Red Sox will still have confidence in him late in games. More importantly, Joe Kelly, Matt Barnes, Heath Hembree, and Ryan Brasier were all effective when called upon. If that group continues to perform, the Red Sox will have a little more bullpen depth than they anticipated at the start of the postseason. Pitching is still in the name of the game in the postseason, and the Astros have a clear advantage in that area. Boston’s lineup will provide a great challenge, but the Astros are just as capable of scoring runs at a high rate. Over the course of six or seven games, the Red Sox may put too much on their bullpen whereas Houston’s rotation should hold up much better without burdening their bullpen with too much work. Look for the Astros to split the first two games of the series in Boston and then take two of three back home. That will allow them to head back to Fenway Park for Game 6 with two chances to take the series. Houston wins in six games.